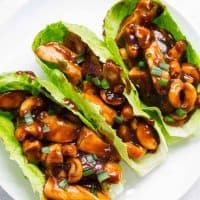 EASY Cashew Chicken Lettuce Wraps - This delicious recipe tastes better than take out and is done in 20 minutes. A flavorful one pot dish that the whole family will love! Heat the butter and oil in a large skillet over medium heat. Once the butter has melted, add in a single layer of chicken. Add a salt and pepper to chicken. Allow to cook for 3 minutes, or until brown and then flip onto the other side. Let cook an additional 3 minutes, or until golden brown. Turn the the heat to low and then stir in the garlic and cook. While the chicken is cooking, whisk together the chicken stock, soy sauce, hoisin sauce, vinegar, and corn starch in a small bowl. Stir into the skillet and cook with chicken over low heat, until the sauce has thickened. Stir in cashews. Serve in lettuce cups or over rice if preferred. Top with chopped green onions if desired. For a little heat, add a few dashes of hot sauce or sriracha sauce to the sauce.